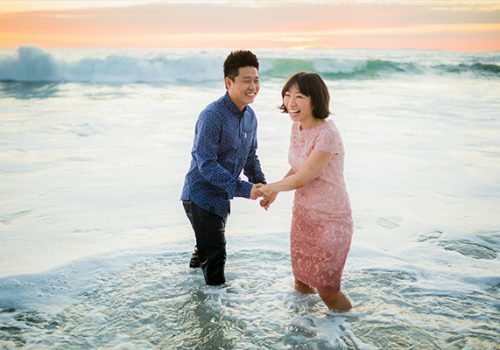 Congratulations on your engagement and welcome to the Lin and Jirsa Site! 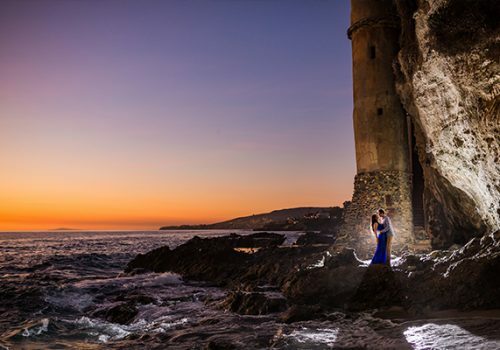 As OC photographers with over 8 years of experience, we’ve had the privilege of photographing some of the most gorgeous locations in the world, many of which are located right here in Southern California. 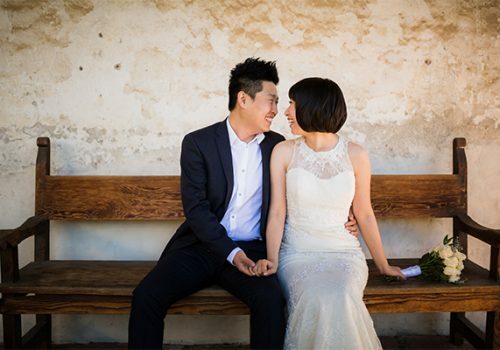 The geographical and cultural diversity of SoCal gives you a range of options. 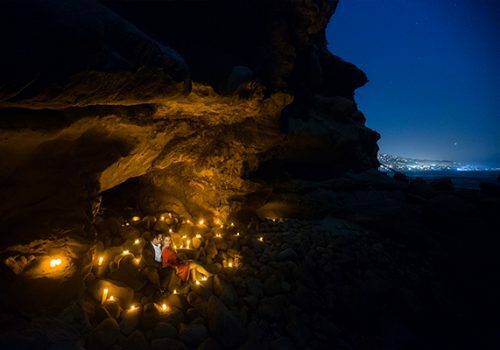 Alluring beaches are only a couple of hours from the deserts and mountains, which are within hours of bustling cities like Downtown Los Angeles. 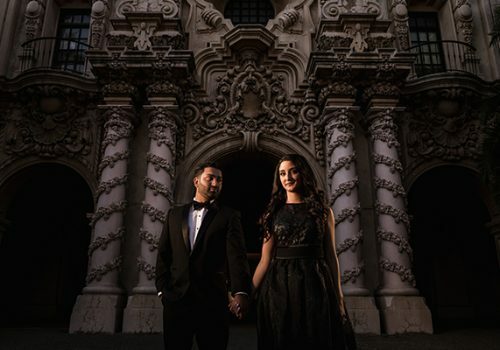 Historical buildings, diverse cultural influences, and amazing natural landscapes combine to provide you with a beautiful range of backdrops for your engagement photos. So we’re here to guide you through the process. 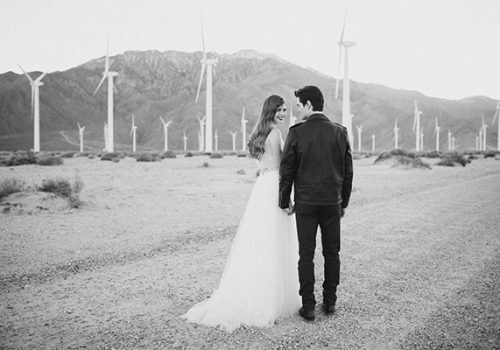 Here are 5 of our favorites that we just have to share with you. 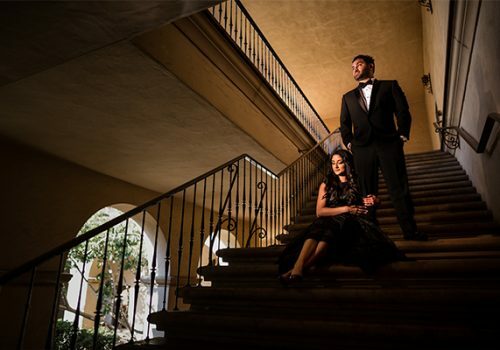 If you’re interested in our photography, we hope you consider contacting us. Founded in 1775, the mission is a rare historic location, and if you want a more old-world look, then the mission should be your first choice. 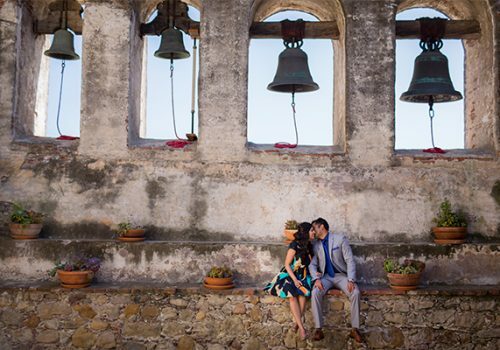 It was founded by Spanish Catholics and carries the title of the oldest building in California still in use. Unique Architecture – The play between light and shadows in what seem like endless hallways create a stunning, romantic look. Fountains, bells and other architectural elements create interesting foregrounds and backgrounds. 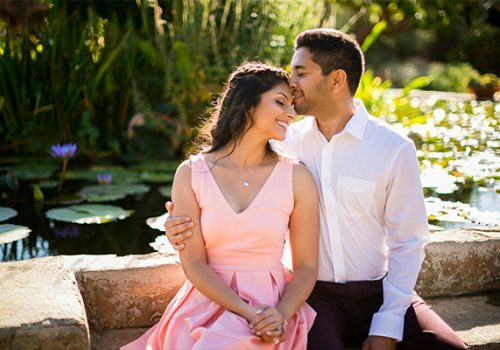 Beautiful Gardens – Carefully manicured lawns, flowers in bloom for most of the season and running water fountains give the center of the mission a wonderful charm. 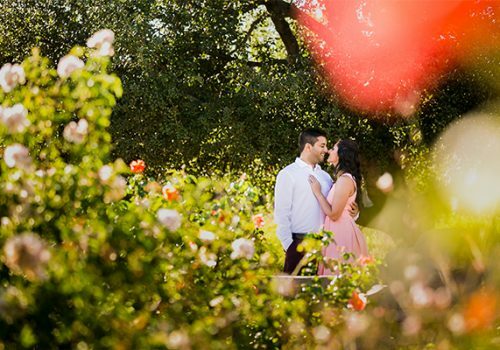 There are also large, interesting trees that allow your photographer to play with the light streaking through the leaves and branches. Ideal Wardrobe – Your ideal wardrobe for this location can vary from casual to formal. Earth tones, like browns and tans will create a consistent vibe and match the stone walls. However, stark and bright colors like reds and blues will “pop” and create an interesting juxtaposition of colors. Ideal time to Shoot – The mission is excellent year round. The best time to shoot at this location is one to two hours prior to sunset. However, most times of the day work for this location because of its many shaded hallways. 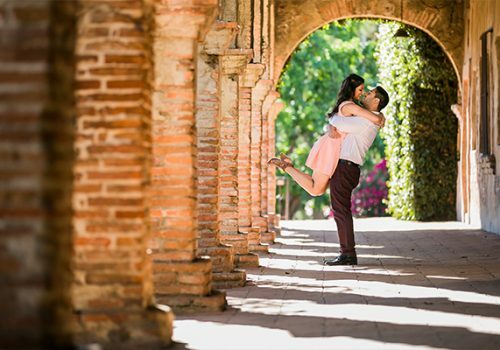 Example Shoots – Click here to see shoots at this location on our blog. Palm Springs is just a quick drive away from LA and OC. The desert oasis is a vacation and music festival hotspot with a preserved history as Hollywood’s playground. 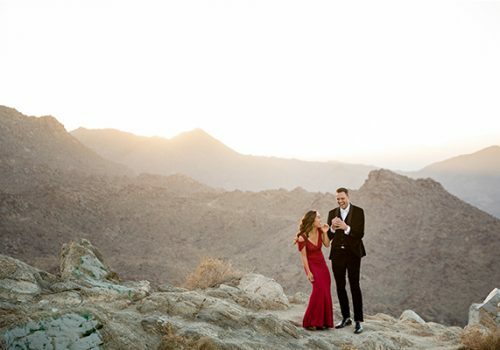 For photographers, it makes a perfect backdrop for engagement photography with stunning desert landscapes, big mountain ranges, unique windmills, and a retro downtown. Ideal Wardrobe – The desert look can fit almost any style of wardrobe. It’s essentially a blank, neutral canvas that works with formal, casual, or even themed looks. You can embrace the music festival culture, pop off the backgrounds with bold colors, or keep things casual and fun. 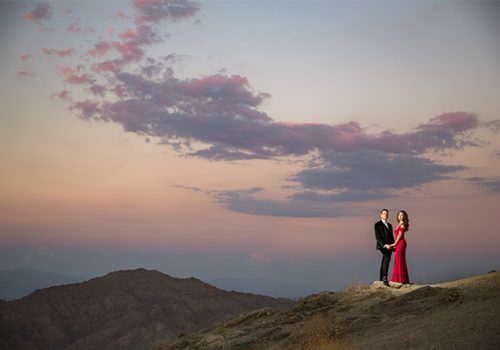 Ideal time to Shoot – The most important thing to note is that Palm Springs can be very hot in the summer time. For that reason, we recommend avoiding the summer time unless you are well accustomed to temperatures over 100 degrees. No matter what time of year, your best time of day to shoot will be right before and after sunset since most of the landscape is out in the open with very little shade. 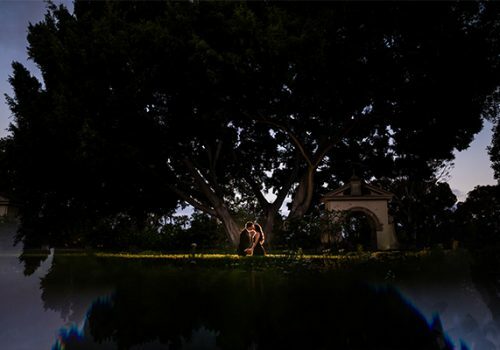 There is close to no end of lovely locations in Balboa Park. 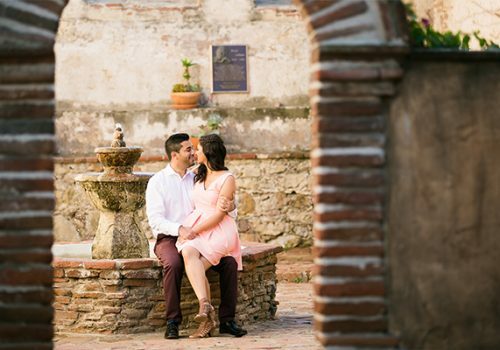 With more than 1,000 acres of land covered in gardens and museums housed inside intricately ornamented Spanish Colonial Revival buildings, you’re sure to find great backdrops for your photos at every turn. Placed in reserve in 1835, the park is unlike other parks in SoCal in that it is one of the oldest recreational parks in the United States. Ideal Wardrobe – The recommended attire for this location is formal, as it matches well with the classic Spanish architecture. 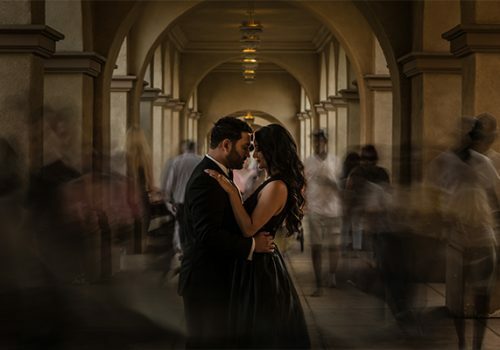 Ideal time to Shoot – While Balboa Park is pleasant every day of the year, the crowds are not! You’ll want to avoid this location on the weekends. Even on summer weekdays, you’ll have a hard time getting a clear shot. The good thing is that a good photographer can either avoid these crowds or embrace them as elements within the photograph. 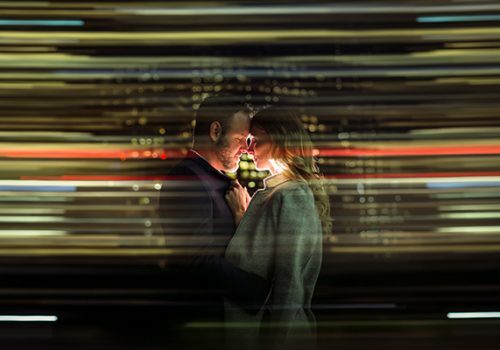 For example, in crowded areas, using slow shutter speeds in conjunction with having the couple hold extra still can create an interesting image with a crisp focus on the couple and motion blur on everyone moving around them. There’s no place like Los Angeles. As the second largest city in the US with a diverse population, sprawling metropolis, and hidden cultural treasures throughout the city, it’s truly a unique place. 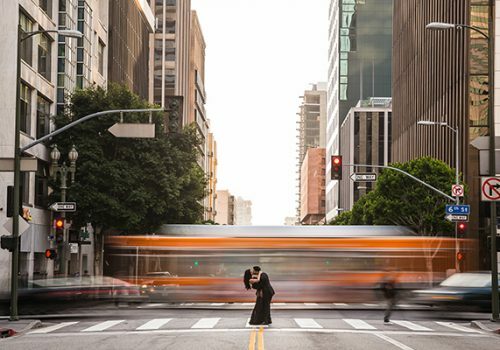 Locations – To lump all of DTLA into one “location” is a little misleading since there are so many different scenes and backgrounds that can be used in any shoot. 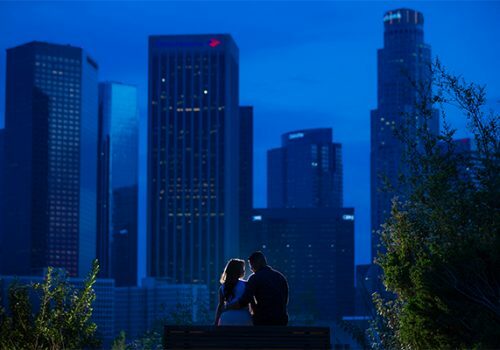 They include the following: Disney Concert Hall, LACMA, Griffith Observatory, Grand Park, The Lost Bookstore, The Modern Art Museum, Chinatown, Union Station, and many others. 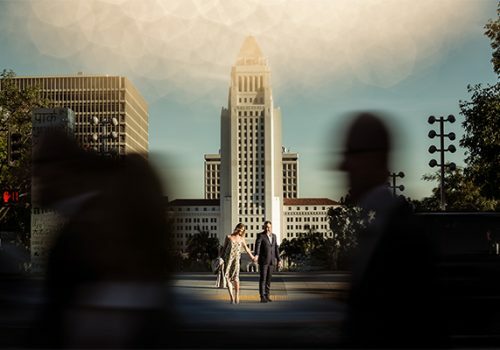 Ideal Wardrobe – The recommended attire for Downtown Los Angeles can be described as “classy date night.” We love semi-formal to formal attire for cityscape shots. Imagine as if you’ve just come out of a concert at the Walt Disney Concert Hall or just finished dinner at a Michelin Star Restaurant. That is the vibe that works best for these photos. 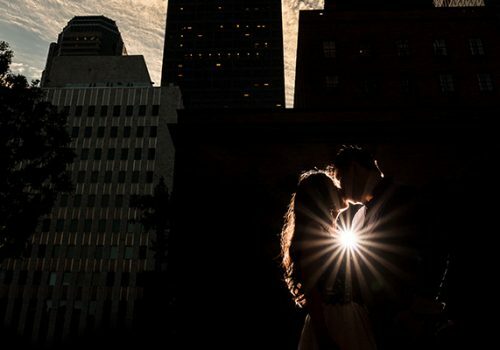 Ideal time to Shoot – While you can shoot any time of year in DTLA, keep in mind that the tall buildings block out the sun earlier than the stated sunset time. 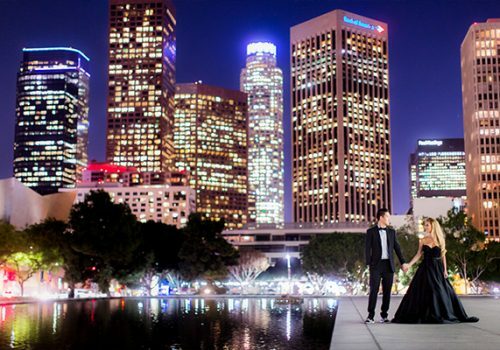 For Lin and Jirsa, no DTLA session is complete without a set of night shots that showcase the stunning city lights. 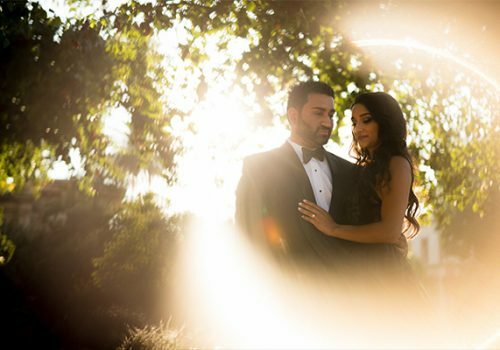 For this reason, many of our clients decide to start their session at the tail end of sunset, capturing a few “daytime photos,” but quickly moving into their night session. 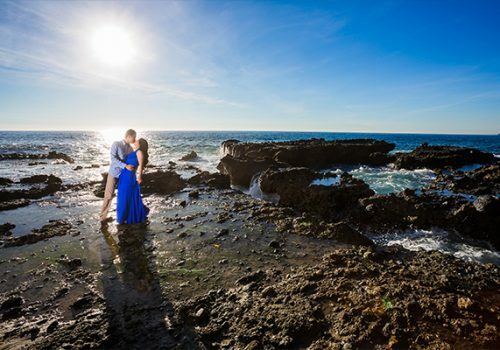 Among our clients, our most popular location is Laguna Beach. These stunning beaches are the perfect backdrop for gorgeous sunset photos. 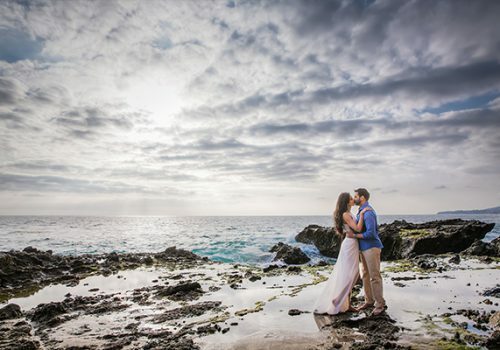 Along the beaches, it’s not uncommon to find oneself entranced by shimmering tide pools. 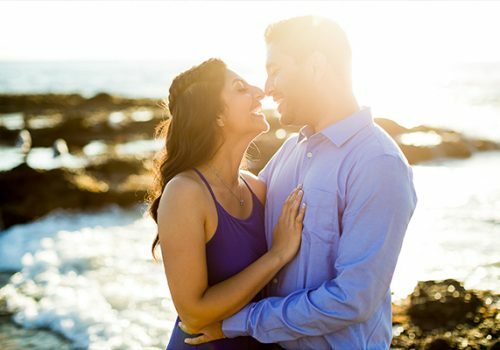 Even Downtown Laguna Beach is filled with unique shops and cozy locations for lifestyle shoots. Ideal Wardrobe – Your wardrobe at Laguna Beach can range from casual to formal. However, keep in mind that some beach photos might require that you get your feet and ankles wet. Also, getting out to some of the locations may require walking on sharp rocks, so be sure to bring sandals or tennis shoes, even if you’re wearing something else for the actual photos. 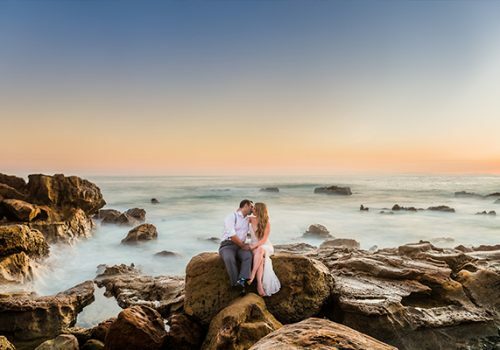 Ideal time to Shoot – You can shoot year round in Laguna Beach. The ideal time to shoot is right before and after sunset. The main weather-related aspects to watch are the tides and the swells. High tide and/or high swells can bring dangerous conditions and make specific areas of the beach inaccessible. 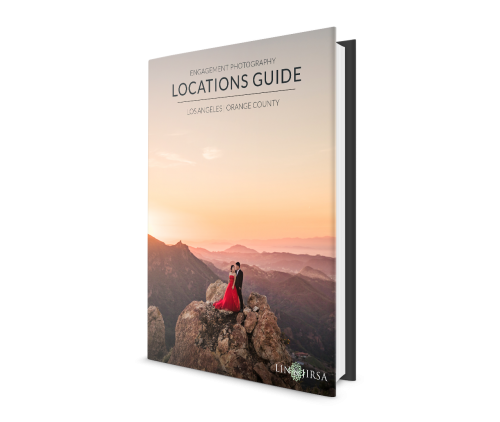 Of course, there are hundreds of other locations in SoCal that we’d love to show you, including the many regional parks, smaller downtown areas, and private mansions. Call or email us to schedule an appointment to stop by our studio to discuss more of your options.